In 1957, with the release of The Cat in the Hat, Dr. Seuss (a.ka. Ted Geisel) started a new era of children’s books. He took a list of 223 easy-to-read words, found the rhyming ones and created a fun and simple blend of pictures and words to encourage children to read. With the success of The Cat in the Hat, Random House created a new division called Beginner Books and put Ted in charge of it. Children were now smiling and having fun as they were learning to read. So, is the “Dr.” really a doctor? Technically, yes he is. But, that was not always the case. It was not until 1956 when Dartmouth had officially awarded Ted an honorary doctorate degree. 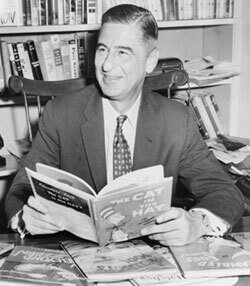 By that time the “Dr.” had 11 published books (Dr. Seuss Book List) & 13 films under his belt. The name Dr. Seuss came about when Ted was doing a regular cartoon feature about animals called “Boids & Beasties” for the magazine publication Judge. He signed his name Dr. Theophastrus Seuss to sound more professional. Just what is Dr. Seuss’s real name? Theodor Seuss Geisel is the name he was given at birth. But, if you’re looking for works published by the famed Dr., it might be helpful to also search under the names, Ted Seuss, Theo LeSieg, Theodor Geisel, Rosetta Stone and even “the Cat himself”. photographer of the Sun Newspaper. Interestingly enough, Ted also referred to himself as another one his favorite Dr. Seuss characters - the GRINCH. Although Ted didn’t author any books under this name, it is the name on the license plate of his Cadillac Seville. The Grinch, as you may already know, is the main character in How the Grinch Stole Christmas. Subscribe to my newsletter below to get informed of upcoming Dr Seuss book events, storytelling events, book recommendations and free printouts. Ted’s publisher bet $50 that Ted couldn’t write a book using 50 words or less? In response, Ted wrote Green Eggs and Ham. The same man who provides the voice of Kellogg’s Tony the Tiger’s “grrreat!”, sings the Grinch’s theme song, “You’re a Mean One, Mr. Grinch”. His name is Thurl Ravenscroft. NASA refers to one of their deep space explorers as “Dr Seuss”, the Data Relay Solar Electric Utility Spacecraft (D.R.S.E.U.S.). The Butter Battle Book remained on the New York Times Bestseller List (for grownups) for six months. In 1984 Ted received the Pulitzer Prize for his special contribution over nearly half a century to the education and enjoyment of America's children and their parents. Boris Karloff (a.k.a. Frankenstein’s monster in the 1931 movie, “Frankenstein”) narrated the animated show, “How the Grinch Stole Christmas”. Dr Seuss has an award named after him. Authors and illustrators are given the Theodor Seuss Geisel Award for the most distinguished book for beginning readers. Ted has 2 Academy Awards. One for Best Animated Short Film in 1950, "Gerold McBoin-Boing". And the other in 1947 for Best Documentary Feature, "Design for Death" (a grownup film). Ted also has 2 Emmy Awards: 1982, Outstanding Animated Program for "The Grinch Grinches the Cat in the Hat", and 1978, Outstanding Childrens Special for "Halloween is Grinch Night". If you are looking to find out more about Seuss you can join a Dr Seuss Book Clubs. Most of the information on this website, I found by reading Oh, the Places He Went, which is a wonderful Dr. Seuss biography for children.